For most people, Easter eggs are dyed, oval-shaped chicken spawn decorated to help celebrate the resurrection of Jesus Christ. But for cinephiles, including "Star Trek" and "Star Wars" director J.J. Abrams, Easter eggs have an entirely different meaning. Stemming from a hidden message in the Atari video game Adventure, the term "Easter egg" in media now refers to a concealed joke or message in a game, TV show, or movie. As with any good Easter egg hunt, these hidden treasures are tough to find. Abrams is somewhat of an Easter egg artist at this point, having connected many of his TV shows and movies with a fictionalized drink called Slusho. And like Steven Spielberg before him, R2-D2 has also figured prominently in Abrams's Easter egg lacing. "R2's really been in all of the movies I've done, really for no other reason than I'm a huge fan, and when I was a kid I realized that R2 was also in 'Close Encounters,'" Abrams told us at last night's "Star Trek Into Darkness" Blu-ray release party. "Actually, I'm putting a 'Star Wars' character into 'Star Trek' as an homage to 'Close Encounters.' So there you go." 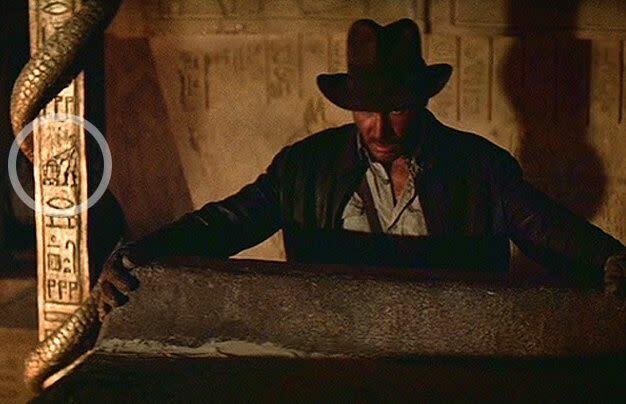 Spielberg didn't stop hiding Easter eggs with "Close Encounters"; he also included R2 in the background of his classic "Raiders of the Lost Ark." And though he didn't direct them, two films he produced — "Goonies" and "Transformers: Revenge of the Fallen" — feature further R2 further cameos. While the little silver R2 lining is always a welcome sight, when Abrams shifts his focus to laying Easter eggs in "Star Wars: Episode VII," is it too much to ask for a hidden "Trek" icon? Perhaps a Gorn drinking at a cantina is in order?